I’ve been thinking about ellipses lately. For Reasons. And then I ask for eight points on an ellipse. On a circle this is easy. 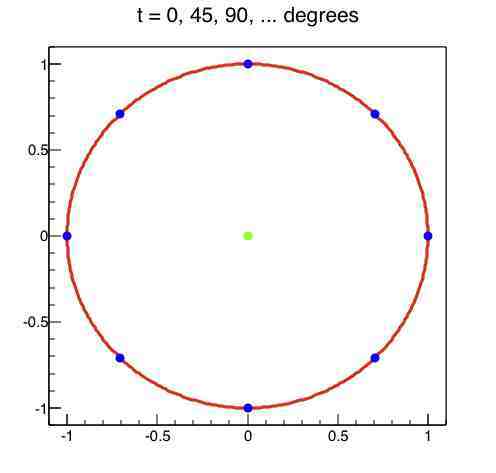 That’s because a circle has continuous rotation symmetry; any rotation by any angle around the center maps the circle into itself. 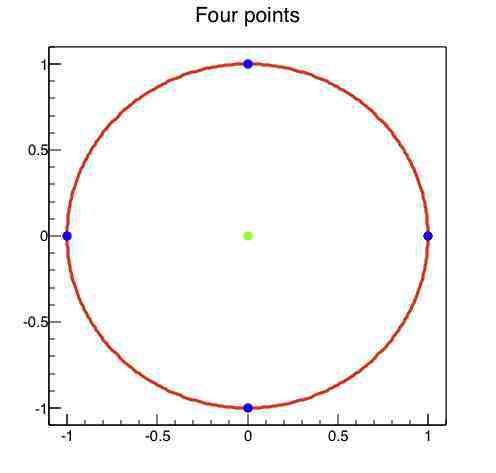 Rotate by 2π/n, 4π/n, 4π/n, … 2nπ/n radians and any point on the circle maps onto n evenly spaced points on the circle. That’s probably not how you thought about it, but that’s a way to do it. 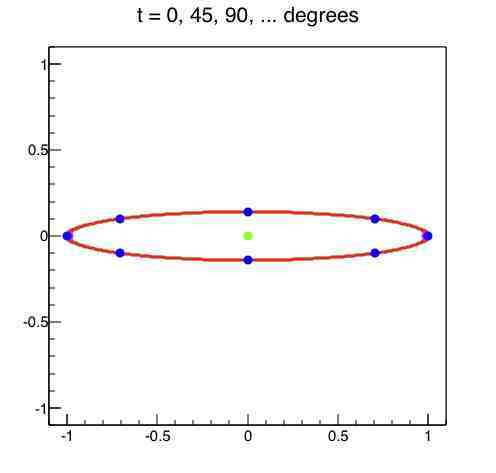 But an ellipse is different. It has only two-fold rotation symmetry: Rotate by π radians and it maps onto itself, but any other angle (in the 0 to 2π range) doesn’t do that. where E is an elliptic integral. Not easy to calculate, in other words. 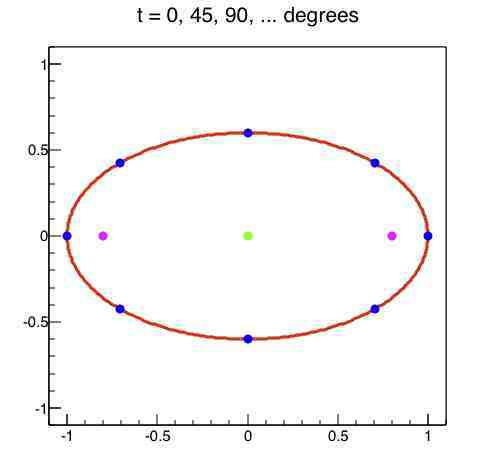 And as a special case of this, the area of an ellipse is A(0,2π) = πab. Focal sector ABF is central sector ABO minus triangle BCO plus triangle ACF. In the case where point A is (a, 0) (at the end of the semimajor axis), triangle ACF disappears and triangle BCO has base aε and height b sin t, so the area of that focal sector is the area of the central sector, abt/2, minus the area of the triangle, abε/2 sin t. : (ab/2)(t – ε sin t). So back to the question. Eight evenly spaced points on an ellipse. Well, what ways are there to do it on a circle? I talked about doing on a circle it by mapping a single point via rotations of π/4, π/2, 3π/4, … 2π radians. 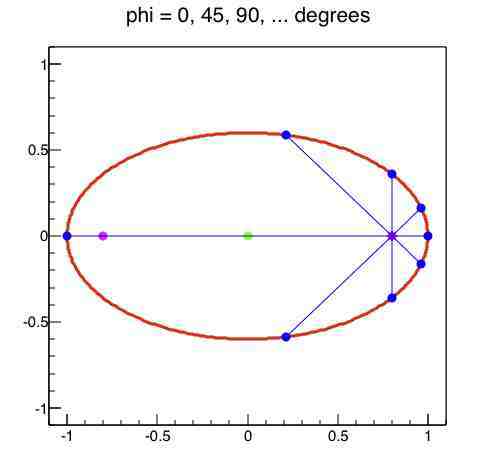 Equivalently, you can draw rays from the origin at angles of π/4, π/2, 3π/4, … 2π radians from the x axis and mark where the rays cross the circle. Another way to think about it is: you know the circumference of the circle is 2πr. So divide it up into congruent arcs each of which is 2πr/8 units long. 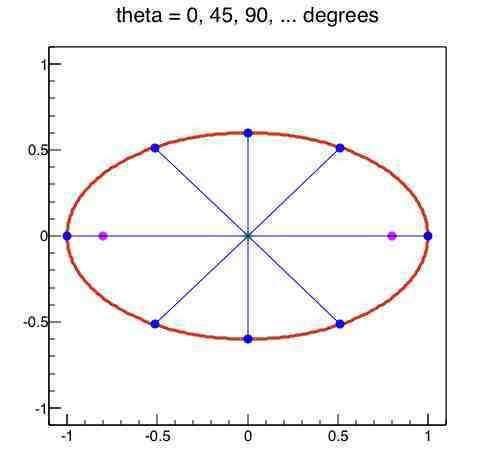 Yet another way: Think of the circle as a pie and cut it into eight congruent slices. Approaches like those will work for any number of points. Another, maybe somewhat odd way to think about the eight point case is to mark the points where the tangent lines have slope 0, 1, -1, or undefined. All of these produce the same result for a circle. What if we try to adapt them for ellipses? First the angular approach. Divide 2π into eighths… but which 2π? 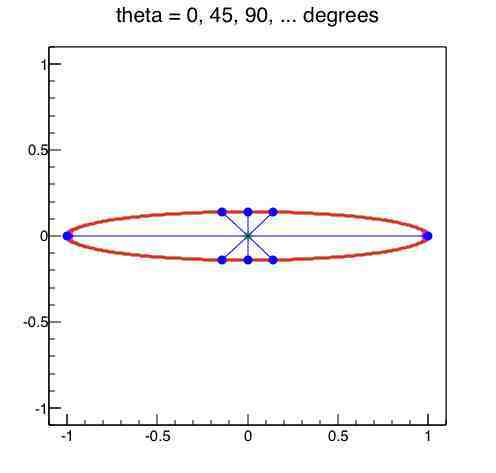 There are really three angles in play here for any point on the ellipse: The parameter angle t, the polar angle θ, and the focal angle ɸ. Well, two focal angles, but they’re symmetric: let’s only consider the +aε focus. 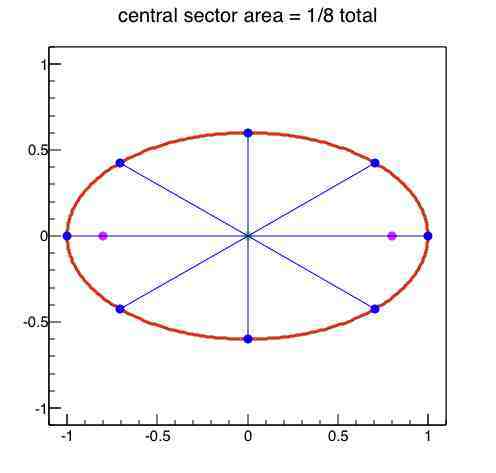 For the circle t = θ and there are no foci (or they coincide with the origin and θ = ɸ, if you prefer) but for general ellipses these all differ. Then the arc approach. You can’t divide the perimeter up into eight congruent arcs, but you can at least make eight arcs of equal length. Next, the sector approach. Again, you can’t cut your elliptical pie up into congruent slices, but you can at least make your slices the same area. But are you cutting central sector slices or focal sector slices? Okay, seven ways to do it: Parameter angles, polar angles, focal angles, arcs, central sectors, focal sectors, and dy/dx. Let’s do this. For each approach compute eight values of t and mark the corresponding points. Ready? That’s probably not what you mean by evenly spaced. 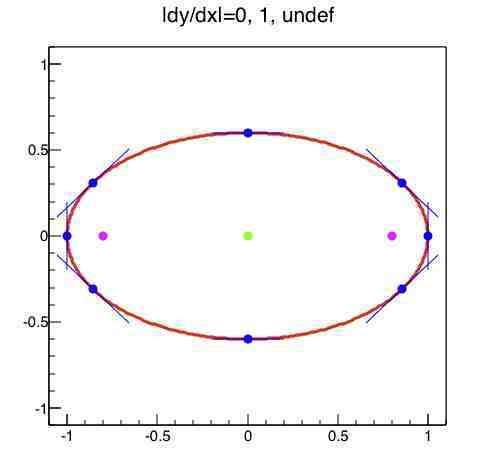 And on our 0.99 ellipse: Okay, that’s really not what you mean. 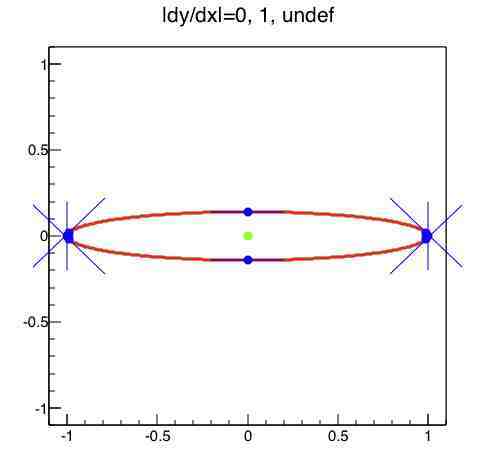 You don’t even want to see the 0.99 ellipse here. Trust me. for t1, t2, and t3 (t0 we’ll set to 0, and the other tn we’ll get from symmetry). Which is… hard. Let’s skip that. and for 0.99: Those are equitable slices of elliptical pie. May still not be what you mean by evenly spaced, though. 6. Focal sectors. Uh oh. The area formula has (t – ε sin t) in it; how’re you going to solve that for t? I asked wolframalpha.com and it just laughed at me. Good thing this is guaranteed to be a silly way to interpret “evenly spaced” anyway. Let’s pretend I never drew that. Right, they give the same result for an ellipse. I am on the edge of my seat here and so disappointed there is no conclusion! I prepared an outline last night that looks very similar to the proposed arc length method. 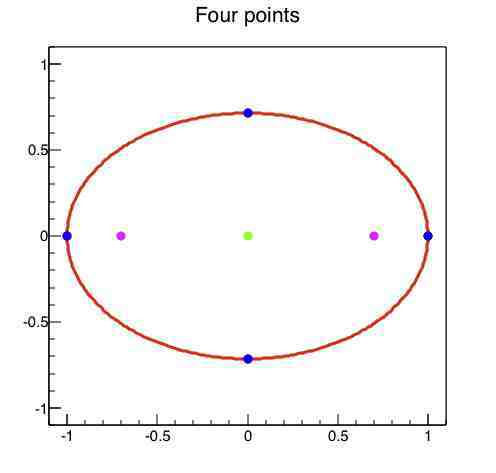 My intent is to approximate a means to distribute points on an ellipse so the linear distance between them is same. I realized before arriving here that equal arclength segments does not facilitate this. Is there a way to solve this problem that does not require programming? If not, has anyone attempted it?